Baylor>Psychology & Neuroscience>About>Faculty & Staff Directory>Annie T. Ginty, Ph.D.
Dr. Ginty completed her Ph.D. in Behavioral Medicine at University of Birmingham. She was awarded the University of Birmingham’s Ratcliffe Prize for best PhD in science. Her Ph.D. work examined the behavioral and neural correlates of diminished cardiovascular responses to acute psychological stress. 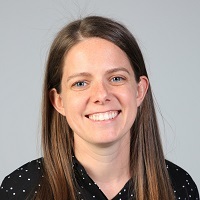 Dr. Ginty was then awarded a two-year AXA Postdoctoral Research Fellowship to investigate the relationship between biological responses to stress and adaptation during a stressful life transition. Dr. Ginty then completed a T32 Fellowship in Cardiovascular Behavioral Medicine at University of Pittsburgh. Dr. Ginty joined the Baylor Faculty in Fall 2016. How does the brain link psychological experiences, such as stress, with cognitive, biological, and behavioral changes that matter for health? This question is at the heart of Dr. Ginty’s research program which integrates neuroimaging, psychophysiological, neuroendocrine, and epidemiological methods. Her particular focus is on the neurobiology of peripheral nervous system and cardiovascular responses to stress and their relationship with unhealthy behaviors and future disease. Brindle, R.C., Ginty, A.T., Whittaker, A.C., Carroll, D., & Lucas, S.J.E. (in press). Assessment of cerebral pressure-flow relationship using psychological stress to manipulate blood pressure. Psychophysiology. Ginty, A.T., Kraynak, T.E., Fisher, J.P., & Gianaros, P.J. (2017). Cardiovascular and autonomic reactivity to psychological stress: Neurophysiological substrates and links to cardiovascular disease. Autonomic Neuroscience, 207, 2-9. Brindle, R.C., Whittaker, A.C., Bibbey, A., Carroll, D., & Ginty, A.T. (2017). Exploring the possible mechanisms of blunted cardiac reactivity to acute psychological stress. International Journal of Psychophysiology, 113, 1-7. Ginty, A.T., Muldoon, M.F., Kuan, D.C.H., Schirda, B., Kamarck, T.W., Jennings, J.R., Manuck, S.B., & Gianaros, P.J. (2017). Omega-3 supplementation and the neural correlates of negative affect and impulsivity: A double-blind, randomized, placebo-controlled trial in midlife adults. Psychosomatic Medicine, 79, 549-556. Carroll, D., Ginty, A.T., Whittaker, A.C., Lovallo, W.R., de Rooij, S.R. (2017). The behavioural, cognitive, and neural corollaries of blunted cardiovascular and cortisol reactions to acute psychological stress. Neuroscience & Biobehavioral Reviews, 77, 74-86. Williams, S.E., Veldhuijzen van Zanten, J.J.C.S., Trotman, G.P., Quinton, M.L., & Ginty, A.T. (2017). Challenge and threat imagery manipulates heart rate and anxiety response sto stress. International Journal of Psychophysiology, 117, 111-118. Ginty, A.T., Williams, S.E., Jones, A., Roseboom, T.J., Phillips, A.C., Painter, R.C., Carroll, D., & de Rooij, S.R. (2016). Diminished heart rate reactivity to acute psychological stress is associated with enhanced carotid intima-media thickness through adverse health behaviors. Psychophysiology, 53, 769-775. Williams, S.E., Carroll, D., Van Zanten, J.J.C.S., & Ginty, A.T. (2016). Cardiorespiratory fitness is associated with general anxiety and perceptions of anxiety in response to acute psychological stress. Journal of Affective Disorders, 193, 151-156. Ginty, A.T., Brindle, R.C., & Carroll, D. (2015). Cardiac stress reactions and perseverance: Diminished reactivity is associated with study non-completion. Biological Psychology, 109, 200-205. Bennett, C., Blissett, J., Carroll, D., & Ginty, A.T. (2014). Rated and measured impulsivity in children is associated with diminished cardiac reactions to acute psychological stress, Biological Psychology, 102, 68-72. Ginty, A.T., Jones, A., Carroll, D., Roseboom, T.J., Phillips, A.C., Painter, R., & de Rooij, S.R. (2014). Neuroendocrine and cardiovascular reactions to acute psychological stress are attenuated in smokers. Psychoneuroendocrinology, 48, 87-97. Brindle, R.C., Ginty, A.T., Phillips, A.C., & Carroll, D. (2014). A tale of two mechanisms: A meta-analytic approach toward understanding the autonomic basis of cardiovascular reactivity to acute psychological stress. Psychophysiology, 51, 964-976. Ginty, A.T. (2013). Blunted responses to stress and reward: A model of biological disengagement. International Journal of Psychophysiology, 90, 90-94. Ginty, A.T., Gianaros, P.J., Derbyshire, S.W.G., Phillips, A.C., & Carroll, D. (2013). Blunted cardiac stress reactivity relates to neural hypoactivation. Psychophysiology, 50, 219-229. Ginty, A.T., Carroll, D., Roseboom, T.J., Phillips, A.C., & de Rooij, S.R. (2013). Depression and anxiety are associated with a diagnosis of hypertension five years later in a cohort of late middle aged men and women. Journal of Human Hypertension, 27, 187-190. Phillips, A.C., Ginty, A.T., & Hughes, B.M. (2013). The other side of the coin: Blunted cardiovascular and cortisol reactivity are associated with negative health outcomes. International Journal of Psychophysiology, 90, 1-7. Ginty, A.T., Phillips, A.C., Higgs, S., Heaney, J.L.J., & Carroll, D. (2012). Disordered eating behavior is associated with blunted cortisol and cardiovascular reactions to acute psychological stress. Psychoneuroendocrinology, 37, 715-724. Ginty, A.T., Phillips, A.C., Der, G., Deary, I., & Carroll D. (2011). Heart rate reactivity is associated with future cognitive ability and cognitive change in a large community sample. International Journal of Psychophysiology, 82, 167-174. Ginty, A.T., Ryan, J.P., Gianaros, P.J. (in press). Neuroimaging and the study of stress reactivity. In S.R. Waldstein, E. Suarez, & W.R. Lovallo (Eds.) Handbook of Cardiovascular Behavioral Medicine. Carroll, D., Ginty, A.T., & Phillips, A.C. (2016). The behavioral, cognitive, and neural correlates of deficient biological reactions to Acute Psychological stress. In G. Fink (Ed.) Stress: Concepts, Cognition, Emotion, and Behavior. Dr. Ginty is currently accepting applications for Ph.D. students to enroll Fall 2019.